Pafford EMS of Mississippi is proud to honor Jonathan Watkins as an American Ambulance Association 2016 Star of Life. Jonathan’s steadfast attitude makes him shine beyond measure in every task at hand. worked as a Paramedic for three years in Arkansas, where on two occasions he worked with the US Secret Service to provide medical coverage for the Vice President of the United States during his hunting trips. In June 2010, Jonathan transitioned to Mississippi as a Pafford employee. He is a Field Training Officer and a Station Supervisor. Jonathan is recognized by his fellow employees, his patients, and their families as a trustworthy, determined, sincere, and hardworking medic. 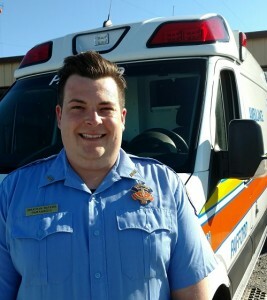 Despite the stress of an EMS job, Jonathan treats each person with the same level of compassion regardless of the type of call, the time of day, or the circumstances. His willingness to share his skills, knowledge, and experience demonstrates that he is a positive role model at Pafford EMS. Jonathan also spends much of his off time serving as an EMS liaison to the local hospital. Pafford EMS is honored to award Jonathan with an American Ambulance Association 2016 Star of Life.